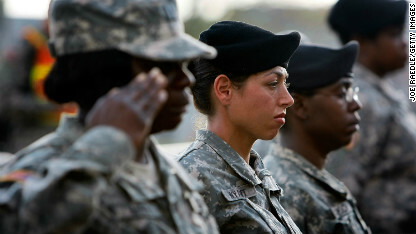 Need to Know News: Military to open combat jobs to women; North Korea makes new threats against U.S.
• Military to open combat jobs to women: "The U.S. military is ending its policy of excluding women from combat and will open combat jobs and direct combat units to female troops, multiple officials told CNN on Wednesday. Defense Secretary Leon Panetta will make the announcement Thursday and notify Congress of the planned change in policy, the officials said." • North Korea makes new threats against U.S.: "North Korea said Thursday that it plans to carry out a new nuclear test and more long-range rocket launches, all of which it said are a part of a new phase of confrontation with the United States." • Boehner says Obama's focus is to 'annihilate the Republican Party': "House Speaker John Boehner told a group of Republicans the day after President Barack Obama's inaugural ceremony that the president's focus was to 'annihilate the Republican Party.'" • Apple to drag market down: "U.S. stocks were headed for a mixed open Thursday, with a sharp sell-off in Apple dragging down tech shares." • Chelsea soccer star apologizes for kicking ball boy: "Eden Hazard, a star for England's Chelsea soccer team, has apologized for kicking a ball boy during a match in Wales on Wednesday, Chelsea says on its website." cnn the totally biast show shazam. all for one --you and to heck with everyone elses opinon. no thanx. Heard in hunting part of the province of Quebec: One hunter said that if Americans want to keep their big rifle, they will have to send the kid with a bullet proof uniform, bullet proof backpack. And it is astounding to us that, American get upset because of Benghazi 4 losses, but what fight to keep even more big guns when they just killed 20 kids of their own little kids on their own land and at school. It is very hard to get the rationale behind this concern about a few Americans killed abroad versus 10,000+ of their own every year who do not seem to MATTER in the debate.